B.Tech Civil Engineering degree course is the engineering discipline that deals with design, construction and maintenance of physical structures like bridges, roads, canals, dams, buildings. It has several sub-disciplines like geotechnical, environmental, structural, transportation, municipal/urban engineering, coastal engineering, water resources engineering, surveying etc. 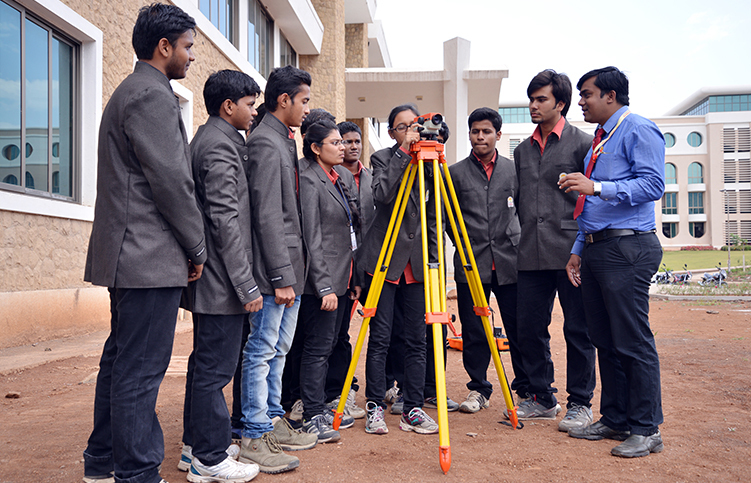 A full-time Civil Engineering course takes 4 years to complete with a with a intake of 60 aspirants. Our B.Tech civil engineering college, Sijoul has highly qualified and experienced faculty and set up labs which have latest equipment for teaching, demonstration and research. We at Sandip University, Sijoul aims at imparting technical know-how and skills to its students who will, ultimately, fulfil nation's infrastructural needs. Through the course, our students will learn all the aspects of executing industrial and residential buildings, structural engineering, construction of roads and water supply and sanitation-infrastructure. Civil engineering opportunities are plenty. Government, Private and Public Sectors require civil engineers both for construction and maintenance of roads, dams, barrages, canals, bridges. Construction Companies always look for civil engineers either for new constructions or repairing existing facilities/structures. Universities, Colleges need Civil Engineers as faculty. After completing higher PG degrees, civil engineers can open their own consultancy services. Civil-transportation engineers are regularly required to design, implement and maintain everyday systems and also for the planning of large-scale projects like mass transit systems, harbor, etc. Work as construction engineers who are responsible for design and safety of temporary structures erected during constructions. Be useful as structural engineers who design and assess major projects for their strength and life-span. Accomplished geotechnical engineers who are responsible for structures built by civil engineers. Job types include Sr Design Engineer, Site Supervisor, Group GM, Technical Officer, Civil Engineer Foreman etc.